I bought the rolling chassis for this Pioneer at Mid-Ohio from Roger. Karl had the 4-speed engine and a bare frame (matching numbers!) and a nice tank! Snoop supplied the other fiberglass. My upholstery guy matched the seat cover – the 69 has a different pattern than the later models. Dean DiCarlo recently came across a headlamp with speedo – which finishes the hunt for the major parts. 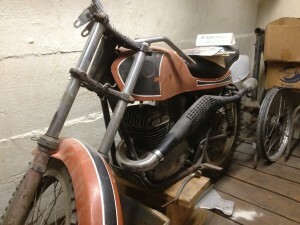 I’m getting ready to start the restoration on Bill Burton’s 69 Pioneer – I think I’ll do mine at the same time! I like the features of this year – different paint scheme, trials handlebars, “cast” footpegs, exhaust on left side, Telesco suspension, low front fender and “vintage” speedo/large headlamp combination!